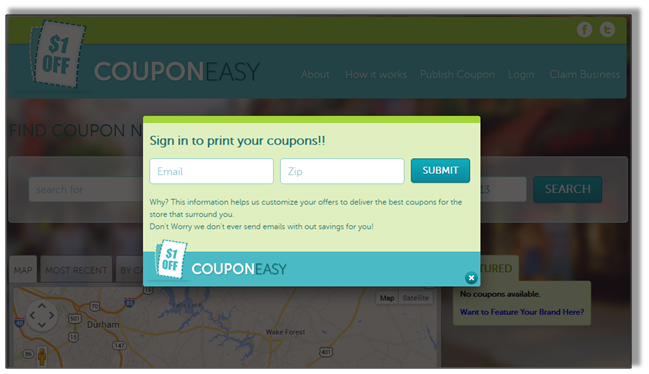 CouponEasy specializes in distributing coupons for local businesses. Their robust engine makes it easy for the user to get recent promos on homegrown brands in the zip code they are located. Their method is simple, just key in your location and let the engine find the deals for you. Not exactly for the major brand shopper, the site was practically made for promoting products and services of small business owners. Hooray for local business support! The reason behind this review is simple: to educate the average user about further savings tactics by finding products and services that are not in the typical coupon sites. With couponing gaining momentum, most of the coupon sites are highly focused on national consumer products that are mostly found on grocery stores or online shopping sites. CouponEasy differs by offering the best local deals from auto body shops to vets. Even when you’re not a registered user, CouponEasy lets you have the best selections for your area. Their wide selection of businesses allows the coupon searcher access to thousands of businesses from auto dealers to the local fast food. Other than that, there is an “Expiring Soon” section that allows viewers to take advantage of offers that will soon be ending. These also benefit the advertising businesses by giving the customers a sense of urgency to react to their promos. Because the site is fairly new, there aren’t as much offers compared to older coupon sites. In addition to that, their focus on local businesses makes searching for offers in smaller towns often come up with fewer options, if not, none at all. Perhaps the best feature of the site would be its ease of use. As soon as you visit the site you are offered the opportunity to sign in with just 2 bits of information – your email and zip code. From there, you are immediately added to the special list of consumers who receive special deals for businesses in their area. Also Read – How do we recover our iPhone photos/ pictures that we have deleted? Location is the prime factor used for giving the consumer the best deals. By typing the keyword, the website automatically searches for related deals in the zip code encoded. Another useful attribute is being able to look back at the coupons that were browsed. There’s no need to worry about closing a tab or window. As long as the user viewed an offer that was of interest, the site automatically adds it to this portion. One thing that might be missing in the site is a quick-add method that allows the user to immediately collect all the coupons that interest them. Right now, the closest thing to this function is to click and view the coupon, and then go to the recently viewed section and print them from there. In addition, there is no way to print all the coupons in one sheet. It takes a lot of clicks if you selected several. The main page practically has everything the user needs to search for coupons. Without having to navigate further from it, it allows the user to get the needed information in just a few clicks. Gathering and printing them is another story. This portion of the site needs improvement so the user can have a seamless experience when gathering coupons. CouponEasy misses FAQs on how to navigate through the site. Although the interface is fairly easy to use, the advanced user might long for some sort of walkthrough to get the most of the site. At this point, the best way to get support is to send an email. There’s a lot of potential for this newcomer in online coupon distribution. CouponEasy’s simplistic approach in providing users and local business owners with the functions that they need to search and promote their products and services is vital in today’s economy. The future success of the site depends on how easy printing and collecting coupons will be for the user. For now, this is something that CouponEasy needs to decipher – the local businesses depend on it. After reading the review, I checked out the website. Looks pretty good to me. Clear, uncluttered, and to the point. Seems like they specialize in Hyper-Local segment. Thanks for the review. I have been availed Couponeasy services before and they did rise upto my expectations. Like any other product, couponeasy does have it’s flaws but their sales reps are honest and give you exactly what they promise. There are some glitches in the service but overall it was a worthwhile experience. Thanks @Mark Evans for taking time to comment. Seems like a great and pocket friendly advertising method. I guess soon these kind of advertising just might replace the traditional methods. Considering I have a photography business, the primary form of advertising is word of mouth, though I would not mind promoting my business through online means. I do not need my major in business administration to understand that growth of e-comm itself is enticing to small business owners and shimmers as a lucrative medium for promotion. Magnifying that down to local level is a blessing for local businesses. couponeasy.com seems to be handling that quite well. Seems like a great advertising platform fro small to mid size businesses.